Twenty inches long. Upper parts gray or gray brown with buff white bars. Cinnamon brown wings and tail barred with white. White underside with breast barred and belly streaked. Black eyes. 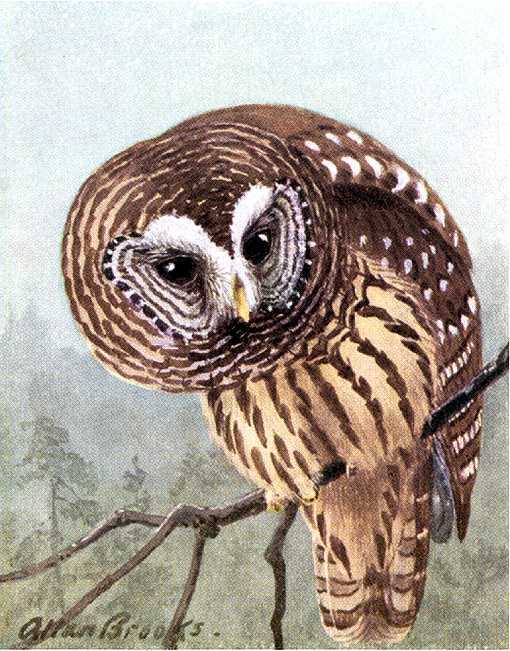 One of the most common of the larger owls in eastern North America and as far west as British Columbia and Northwestern US. 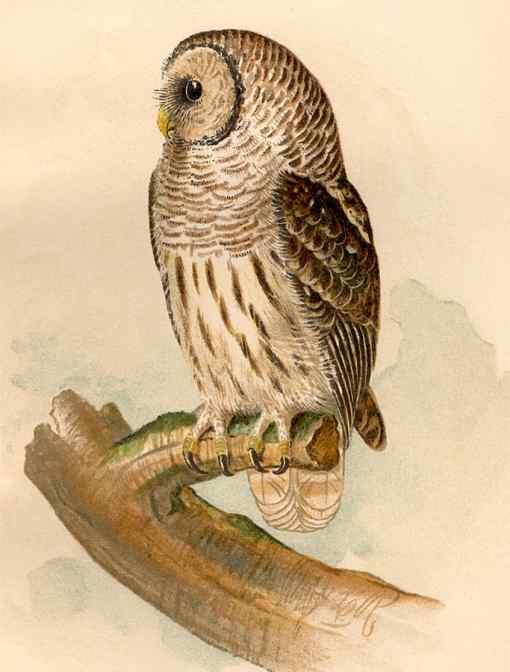 Barred owls inhabit forests throughout most of eastern North America from Mexico and Texas to southeastern Manitoba and from the Great Plains to the East Coast. From their range in western Canada and northwestern US, they have encroached southward into spotted owl ranges in Oregon and northern California. Hoot with an almost human like deep-toned voice sometimes in concert usually at the beginning of the night and again before dawn, although they may call throughout a moonlit night. They readily respond to an imitation of their call, try it. Hunt mostly for mice and other small mammals, also reptiles, fish, crawfish, birds and insects. Nest in natural or abandoned tree cavities, abandoned crow or hawk nests. Commonly nest in the same hole for many years. Females lay two to four white eggs which hatch after about four or five weeks incubation and young leave the nest in about another six weeks. The Barred Owl Nest Box has a 12″ by 12″ floor, 22″ inside floor to ceiling, 7″ diameter entrance hole, with a leveled bottom, located 18″ above the floor to the top of the hole and ventilation openings in the floor and under the roof. Assemble this nest box with corrosion resistant screws fit to pre-drilled countersunk pilot holes to reduce wood splitting. A hinged roof can be secured with shutter hooks for easy access or at significant heights a fixed roof and Side Opening Doors may be a more convenient and safer alternative. Mount 15 to 30 feet high in forested bottomlands or near flooded river valleys or swamps (not in clearings). Place some wood chips on the floor. Barred owls inhabit forests throughout most of eastern North America from Mexico and Texas to southeastern Manitoba and from the Great Plains to the East Coast. From their range in western Canada and northwestern US, they have encroached southward into spotted owl ranges in Oregon and northern California.